UNITED NATIONS, February 24 -- Top UN humanitarian John Holmes has confirmed to The Times that he will leave New York later this year, setting off a major powers game of musical chairs for senior UN posts. This comes ten days after Inner City Press reported that Holmes would be returning to the UK, and Holmes denied the story vociferously on the margins of a press stakeout about Haiti and Somalia. According to the Times' James Bone, Sir John will take over from Jeremy Greenstock at the Ditchley Foundation, consider once of the easiest UK Foreign Office sinecures: putting together conferences on a country estate in Oxfordshire. The UK initially said it would not be seeking to retain the humanitarian post but rather seek Political Affairs, currently held by American Lynn Pascoe, or the S-G chief of staff post, currently held by India's Vijay Nambiar. But the UK has clarified that no decision has been made to forgo OCHA for one of the two other posts. 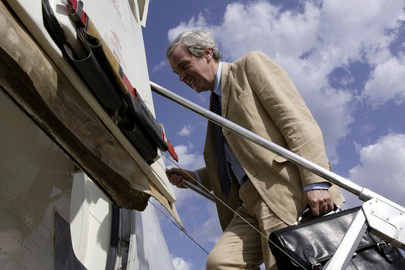 Francophone sources predict that former French Ambassador Jean Maurice Ripert, who last year was given a temporary post as the UN's humanitarian coordinator for Pakistan, may return to New York to take over Holmes' OCHA post. Bernard Kouchner, Ripert's mentor, is said to want to control UN Humanitarian Affairs. But this would require Alain Le Roy, also French, to step down as head of UN Peacekeeping. Obama's UN Ambassador Susan Rice, headed through bad weather from DC to the UN for Wednesday's Security Council briefing on drug trafficking -- she began her statement at 11:40 am-- spoke earlier this week on Peacekeeping, and Tweeted it too. Factual footnote: Susan Rice and and U.S. General Fraser are scheduled to meet with Holmes on February 24 about Haiti. For the US to take Peacekeeping, Lynn Pascoe would have to go. Then the UK could take Political Affairs, and Ripert's France take over Humanitarian Affairs. The Western Permanent Three play musical chairs. But what of Nambair? What of India's aspirations for the Peacekeeping post? What of Egyptian USG Shaaban Shaaban, currently under fire in the UN Dispute Tribunal? If Shaaban is removed, perhaps Egypt's Permanent Representative will get the UN post he has long sought. Watch this site. Footnote: Also on the UK tip, when Labour Party deputy leader Harriet Harman came to New York she targeted invitations to female Permanent Representatives. But some countries responded that their PR is otherwise occupied, and proposed that the Deputy come instead. So the UK had to ask, or look up: is the Deputy a female? UNITED NATIONS, February 12 -- At UN's annual signing of "compacts" on Friday morning, the buzz from one Under Secretary General to another was that top UN Humanitarian John Holmes "is leaving to go back to the UK." Later another senior UN official, not present at the Compact signing ceremony, told Inner City Press this same thing. Holmes was not present to sign his Compact, being in Haiti. Anna Tibaijuka, removed by Secretary General Ban Ki-moon inexplicably from running the UN's Nairobi office, was equally inexplicably not present, even by video conference. Her Nairobi chief successor Achim Steiner, handpicked by Mr. Ban, was present, with the image of a tree behind him. Steiner signed two Compacts, as did Cheick Sidi Diarra, still moonlighting between Least Developed Countries, Landlocked and Small Island Developing States and the Special Adviser on Africa position, which some in the General Assembly say has become moribund under Mr. Ban. The Assembly has voted that the post must be filled, but it has yet to happen. As in February 2009, Inner City Press was the only media organization there. Even for the photo op, only UN Television and UN Photo were there. Nevertheless, Mr. Ban in his prepared remarked said the UN was making these signings "as public as possible." The documents, and reports on performance, will go only on the UN's intranet, not available to the public, to "we the peoples." Many of the Under Secretaries General at the ceremony rarely if ever speak to the press. Chief UN lawyer Patricia O'Brien, in her few appearances, has stuck narrowing to issues of the Hariri Tribunal, refusing questions even on the UN's involvement in Cambodia's tribunal. Inga-Britt Ahlenius, recently in the media for OIOS' alleged policy of not pursuing former UN employees or third party contractors, has not held a press conference in the Compact annual cycle. New Safety and Security chief Gregory Starr has not spoken with the press, other than a single interview with the correspondent of the Washington Times (which recently closed its UN bureau by means of massive layoffs). Starr is the only new UN senior office since last year. Now, a needed shakeup may be near. Mr. Shabaab Shabaan, while affable, has yet to hold a press conference, despite being in the news for a damning UN Dispute Tribunal decision about his management. Ban's spokesman Martin Nesirky, who sat in the corner during the signing ceremony, announced only that Ban will appeal the UNDT decision, but refused Inner City Press' question for a statement of the basis of the appeal. Some absences were more than understandable. Lynn Pascoe, along with Ban's closest advisor Kim Won-soo, was still on his North Korea trip. Mr. Ban told the Press that he spoke with Pascoe, who had not met with Kim Jong-Il to whom Ban sent a leather bound copy of the UN Charter in six languages. Neither top peacekeepers, Alain Le Roy nor Susana Malcorra, was present. Inner City Press saw both of them less than an hour later going into the Security Council. In the Council, another USG spoke: Alan Doss, whose six line e-mail urging UNDP to show him "leeway" and give his daughter a job is still being investigated by the UN some eight months later. Why does USGs like Doss sign Compacts, and abide by them? As with everything in this UN, it is a work in process, not necessarily in progress. Watch this site.